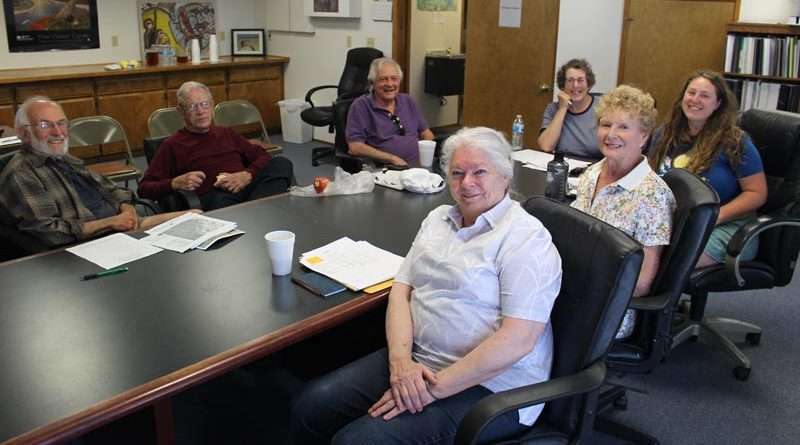 The Lake Almanor Watershed Group met Wednesday, May 9, in the Maidu Summit Consortium conference room in Chester to discuss water issues as they relate to the Almanor Basin. In attendance were board members Aaron Seandel, Bridie Johnston, Peggy Fulder, Carl Felts and Charlie Plopper. Courtney Gomola, watershed coordinator, and Dr. Gina Johnston, retired CSU Chico limnologist, were also present, along with Ricky Prows and Chairman Ben Cunningham, representing the Maidu Summit Consortium. Gomola provided updates that all funding that was allocated to Sierra Institute to support watershed coordination in 2017 had been expended. Time spent on watershed coordination and proposal development would now be withdrawn from an anonymous donation given to support those purposes. With financial support from the Rose Foundation, Gomola has been working with the AP Environmental Science class at Chester High School to incorporate LAWG’s water quality data into their classroom studies. Board member McReynolds, who was not in attendance, said by email that he gave a presentation to the class and then took students out to sample the North Fork Feather River the next day. Students would analyze this data and draw conclusions about trends, he said. The group agreed this is in line with their goal of engaging youth. It was also suggested the students write a report to the newspaper on what they find. Gomola read information regarding water-sampling updates supplied by McReynolds. Plopper also stated that Mountain Meadows Conservancy has $15,000 in matching funds for potential projects, not $10,000 as had been previously estimated. It was announced that the U.S. Forest Service had a recent meeting about putting money into culverts and roads on the Lassen National Forest that have drainage issues. They will be soliciting suggestions on problem areas and this will be a good time for LAWG to make suggestions on major runoff areas. It was also announced that Highway 89 is now open to traffic using a one-lane bypass during the Lake Almanor Spillway Bridge replacement construction project. It was stated that Seandel gave a presentation to the Lake Almanor Country Club Board of Directors in April, pointing out the benefits and need for community support for water quality. LAWG should be receiving the $3/lot donation this year from the Lake Almanor Country Club, as these fees were collected in 2017 and already incorporated into the 2017 budget. It is unclear if the board will approve these fees for 2018 given that the community and priorities of LACC are changing. There are also issues with residents feeling like these responsibilities should fall on PG&E. The group discussed that this was a common misconception, as PG&E continues to ignore the need for water quality sampling in the area. The financial picture for Almanor West seems about the same, with this year’s donation likely but next year’s remains unsure. Seandel attended a PG&E lake level meeting with Sherrie Thrall, Bob Lambert, and Jeff Greening. Due to moderate-to-high precipitation levels and a lot of water being held back from Oroville, lake levels at Almanor will be very high this year. However, high energy demands downstream could always necessitate more drawdown. Current levels are 2.5 to 3 percent above normal, he said. Gina Johnston confirmed that she received the information from the April/May sampling that Lake Almanor is well oxygenated, but still very cold (colder than last year by 1 to 2 degrees) and hasn’t stratified yet. Johnston reported that there is a lot of healthy zooplankton, which will provide a good food source for fish this season. There is not a lot of blue-green algae, she noted, but numbers tend to grow later in the summer so more will be known then. Gomola worked with Johnston to develop language summarizing the 2017 Water Quality report, which is accessible from the LAWG webpage. Regarding the lake update, the LAWG and the California Department of Water Resources initiated their 2018 Water Quality sampling this spring on April 30 through May 1. For more outreach, Gamola said she would soon send information to the Chester Progressive on the 2017 report, and a quick paragraph on current conditions at the lake with each sampling. LAWG members asked about easier access to online materials, and Gomola raised the potential of buying a LAWG-specific domain that would bring users to the Sierra Institute webpage. Gomola said she sent an application to the Campbell Foundation to support expanded wastewater/storm water assistance and water quality monitoring to include coliform and additional locations, which unfortunately was unfunded. She also reached out to the State Water Resources Control Board about their non-point source pollution problem. It seems a similar LAWG project may be eligible under the Timber Regulation Forest Restoration Fund based on initial review of the application. A follow up with the Water Quality Subcommittee will be planned. Plopper suggested potentially pairing with the South Lassen Group to make the grant more competitive. Gomola also suggested partnering with the Maidu Summit Consortium to develop storm water gardens along the lakeshore with culturally sensitive plants to prevent unwanted contaminants like fertilizer from entering the lake from runoff. While welcomed, it was pointed out that they’d have to work with PG&E as most of these storm water gardens would be on its land. Maidu Summit Consortium board members Prows and Cunningham reported that they had just returned from a meeting with other MSC members and a forester at Humbug Valley. Prows wanted to inform the board that Humbug Valley (Tásmam Kojóm), along with two of five other properties have been transferred to the Consortium on May 2 after years of discussion with previous owners PG&E. MSC has begun work at Humbug Valley to restore the area and looks forward to doing more plantings, implement fire control measures and landscape management now that the transfer of the land has been approved. Cunningham shared how the MSC has been consulting with U.C. Davis to grow culturally sensitive plants for restoration in Humbug Valley. The annual Friends of Humbug gathering will take place Saturday, July 21, at Yellow Creek Hunter’s Campground and will include a potluck. The festivities are open to the general public. Mountain Meadows Conservancy hosted a Friends of Mountain Meadows meeting May 2. While PG&E wasn’t present, it was announced they would donate $2,500 to buy young bass to restock the lake. Public members have taken the initiative to raise funds to match this donation so more fish may be stocked in the Mountain Meadows Reservoir. Fulder and Plopper shared a water trails/recreation update with the board, mentioning the incredible work of the Trails Committee of late to improve and restore trails, including getting 68 students out onto the new Collins Pine Trail, which included fourth- and sixth-graders and Chester High school students. They’re also working on submitting a proposal to develop a trail from 1st Avenue to Highway 89, a challenging effort given the many landowners that must agree to the new trail crossing their property lines. They hope to make two trailheads, a parking area, bird watching platforms, a disc golf area, kiosks and a place to camp, and include a lot of information about Maidu culture. There are a lot of water trails maps available for restocking this summer, but Fulder needs help in getting the work done contacting local businesses in Chester and around the Lake Almanor Basin willing to carry the unique maps. Note: This article was written using primarily the minutes from the LAWG board meeting taken by Courtney Gomola, who was also instrumental in providing extensive fact checking of the information contained within.